This sanguine anticipation derives from the fact that in a near unanimous vote at the UN General Assembly on December 3, 2012, the vast majority of countries listed their support for the Comprehensive Nuclear-Test- Ban Treaty (CTBT) – which, according to Rebecca Johnson of Acronym Institute, "remains a key piece of unfinished business of the nuclear age". The CTBT resolution was adopted by 184 votes in favour, representing an all-time high, one against (North Korea) and three abstentions (India, Mauritius, Syria). The resolution "urges all States that have not yet signed the Treaty, in particular those whose ratification is needed for its entry into force, to sign and ratify it as soon as possible." These States are the remaining eight of 44 in possession of nuclear technology that have yet to formally embrace the CTBT: China, North Korea, Egypt, India, Israel, Iran, Pakistan and the United States. The voting results showed an increase in support with a record number of countries voting in favour of the CTBT. Previous year's resolution on the CTBT was adopted with 174 countries voting in favour, with the same number of votes against and abstentions as in 2012. Despite not having signed the Treaty yet, Pakistan voted in favour of the resolution. The UN General Assembly also approved a resolution on The total elimination of nuclear weapons. The Japanese draft includes a paragraph that "Urges all States that have not yet done so to sign and ratify the Comprehensive Nuclear-Test-Ban Treaty at the earliest opportunity". The paragraph was approved by 165 countries voting in favour and only North Korea voting against. The overall resolution was adopted with a margin of 174-1-13. The resolutions of the General Assembly are not legally binding, but are important recommendations that show the political stance of UN Member States on the issues concerned. There were three further resolutions stressing the importance of the CTBT on: Nuclear Disarmament, Towards a Nuclear-Weapon-Free World, and the Follow-up to the advisory opinion of the International Court of Justice on the Legality of the Threat or Use of Nuclear Weapons. The General Assembly meeting came two months after the Ministerial Meeting on the CTBT, which issued a joint statement stressing the importance of the CTBT as a "vital step" towards nuclear disarmament. United Nations Secretary-General Ban Ki-moon told the States that have yet to sign or ratify the CTBT: "You are failing to live up to your responsibility as a member of the international community." Though eight of 44 nuclear capable States have yet to embrace the Treaty, since CTBT opened for signature in 1996, 95% of the world’s countries have subscribed to the norm that bans all nuclear explosions. According to the Vienna-based CTBTO, which observed its fifteenth anniversary in February 2012, nuclear testing has virtually ground to a halt. The Treaty's unprecedented verification regime – a "system of systems", comprising a $1 billion investment – is nearing completion and already ensures that no nuclear explosion escapes detection. Technical backing: CTBTO takes pride in the fact that with the help of member states, it was able to complete the installation of nine more monitoring facilities, meaning that the International Monitoring System is now over 85% complete. Installation has also started for seven new facilities. In the United States, the National Research Council issued a positive technical and scientific assessment of the verification regime's detection capabilities in March 2012. Financial assistance: CTBTO also points out that the payment of regular contributions by 183 member states was higher than in the previous year – despite the difficult prevailing global economic situation. In addition, according to the CTBTO, the European Union has made a new voluntary contribution of over € 5 million (nearly US$ 7 million) which will be used to further upgrade the organization's monitoring capabilities to detect nuclear explosions and to assist developing countries to take a more active part in this joint effort. "A contribution of this magnitude, especially in times of austerity budgets, is testimony to the EU’s unwavering support for the Comprehensive Nuclear-Test-Ban Treaty (CTBT) and the CTBTO," the organization's Executive Secretary Tibor Tóth said. Also a voluntary contribution by Japan of around US$ 737,000 will enable the organization to track airborne radioactivity with greater precision," the CTBTO says. The Science and Technology 2013 Conference (SnT2013) will be held from June17 to 21 at the Hofburg imperial palace in Vienna. This scientific conference will provide a platform for hundreds of scientists to discuss further enhancements of the CTBT's verification regime. On August 1, Lassina Zerbo, who has been elected by member states as the organization's next Executive Secretary, will assume office, taking over from Executive Secretary Tibor Tóth, whose term ends on July 31. Zerbo is currently the Director of the CTBTO's International Data Centre Division. During the UN Ministerial week in September, Member States will gather for the next Article XIV Conference to generate new momentum for the entry into force of the CTBT. The previous (fifth) Conference to promote the Comprehensive Nuclear-Test-Ban-Treaty concluded on September 18, 2007 with urgent calls to hold-out States to sign and ratify the Treaty. Representatives of 106 States, including two non-signatory States, participated in the two-day Conference. 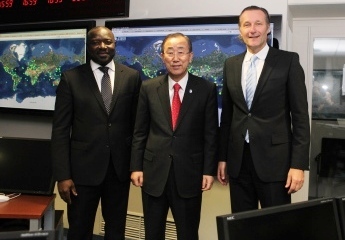 Throughout the year 2013, the CTBTO will press ahead with preparations for the next major on-site inspection exercise. The next so-called Integrated Field Exercise will take place in Jordan in 2014, three years after the previous such inspection. On-site inspections are conducted to verify States Parties' compliance with the Comprehensive Nuclear-Test-Ban Treaty. An on-site inspection is launched to establish whether or not a nuclear explosion has been carried out. During such an inspection, facts might also be gathered to identify a possible violator of the Treaty. It thus constitutes the final verification measure under the CTBT.